HP LIFE is a peer-reviewed Open Educational Resource for students, entrepreneurs and small business owners around the world who want to gain real-life business and IT skills to learn about, start or grow a business. Enroll in HP LIFE today! Since 2013, NACCE has brought HP LIFE e-Learning resources and insights to the community college campus and researched how this free online learning tool can be utilized to foster innovation, enable business starts and create jobs. We also seek to understand how the use of technology (content, networks, etc.) in the classroom adds value to the current entrepreneurship education classroom experience and advances our understanding of how community colleges can capitalize on technology, workforce and entrepreneurship trends. To help you implement this free tool, contact Leah Deppert at deppert@nacce.com. Funding for this partnership comes from the generosity of the HP Foundation. The HP Foundation is committed to raising people up and assisting those around the world who need it most. Along with HP Inc, the HP Foundation works to help make life better for everyone, everywhere by giving people access to the skills, technologies and capital they need to succeed. 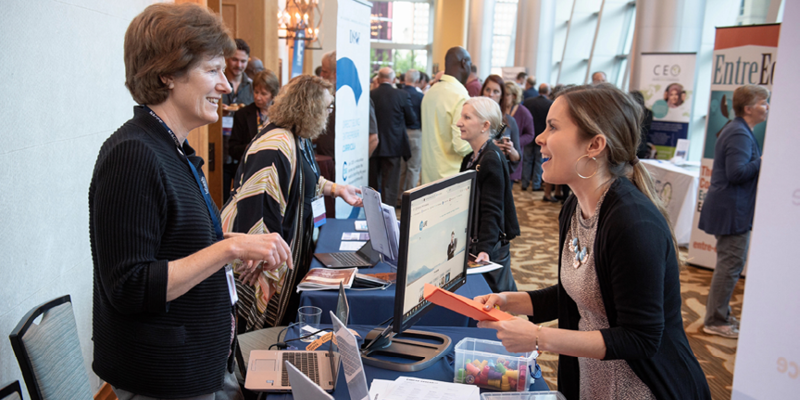 Debbie Ledbetter, Partnership Manager at HP LIFE, and Leah Deppert, Manager of Marketing and Communications at NACCE, talk about HP LIFE as an excellent Open Education Resource at NACCE's annual conference. HP LIFE e-Learning has been implemented by hundreds of faculty/directors in their programs or business centers. Thousands of students/clients have completed over 30,000 HP LIFE e-Learning courses. As a result of the program’s implementation into community colleges and small business development centers, learning in the community college classroom has improved student learning outcomes, increased job possibilities, and enriched teaching experiences via curriculum possibilities and pedagogies. Please fill out this brief survey so we can acknowledge our most active users.